Below is a portion of our 3rd quarter 2018 letter for clients. As a reminder - Since we manage each client's portfolio separately, any comments on performance or individual holding for a client may be omitted. There are very few certainties when investing. Stocks might go up or down tomorrow, interest rates may rise or fall, companies may succeed or fail...by now we should know to expect the unexpected. But the one idea often held as gospel in the investing world, something that should always be expected we are told, is that bonds offer diversification from stocks. When stocks decline, the bonds in the portfolio will be there to help, offering safety and return when you need it most. This has held true throughout history. Most recently in 2008, when U.S. stocks fell 38% for the year, while a 10 year treasury bond earned a positive return of more than 20%! With that in mind, here’s how certain investments have performed since reaching their high prices of the year in January. There have been very few places to hide. Once seemingly “safe” investments such as bonds are falling as much as many stocks! Just how rare is this? Since 1930 there have been just 3 years in which both stocks (as measured by the S&P 500) and bonds (as measured by a 10 year treasury bond) have both had negative returns. We are in rare times indeed! This is providing an interesting environment. What is the “safe” asset today? Let’s take a quick look at the stock and bond portions of our portfolio to see how we have fared during this period, what we are doing to weather this rare scenario, and what we see going forward. The rest of the world is catching up with the United States. 60 years ago the United States was responsible for nearly 50% of worldwide GDP. Today, the U.S. is responsible for “just” 25%. Generally speaking, 75% of economic production in the world occurs outside of the United States today. So, it is becoming increasingly obvious that if investors want continued growth, they need to begin allocating more money into international markets. In 2016 we began allocating a higher percentage of client portfolios to international stock markets. Younger clients likely have 30-35% of their stock allocation in international companies, older clients around 10-15%. The primary international area we diversified to was emerging markets, which benefited us greatly last year when emerging markets were up nearly 40% on the year. This year, emerging markets are one of the worst performers in the world, mostly due to China, whose stock market is down 30% this year. If you buy a basic passively managed, low cost emerging market index fund today, it can be allocated 40% or more to China. I think China has some major potential problems, and so I was very hesitant to allocate so much client dollars to China even with its growth. So early this year, we began splitting international allocation into 3 different funds that steered a large portion of our international allocation away from China. While this was technically a good move so far, other international markets have still declined. We avoided some pain, but did not come out unscathed. While China may be down 30% this year, many other markets are down 20%. China is still the tail that wags the dog, and that is becoming very hard to get away from. One bright spot in our portfolio is two preferred share issues from Bank of America and Wells Fargo (you will see these in your account as BAC-L and WFC-L). These are your 2 largest individual, or non-ETF, security holdings and they are up 4.3% and 4.5% respectively since January. U.S. stocks have been one of the few bright spots in the world. But with a year like this one so far, the bar is pretty low. Since the highs in January, U.S. stocks, as measured by the S&P 500 index, are down about 2%. This should not come as a huge surprise to anyone. We spoke in our last letter about how the current stock market rise is unprecedented. We have had just 1 negative year in U.S. stocks markets in the last 15, where historically stocks average a down year 1 in every 4. A down year, as unusual as it may seem today, is just part of the normal market cycle. If we have done one thing right this year – It is our continued stance to hold no long-term bonds in our client accounts. Clients hold only shorter-term bonds. Although short term treasuries are down 2.5% this year so far, we have been lucky to be allocated to the “least bad” option thus far. As of now, this will continue. Short term interest rates in the United States have been rising rapidly. 1 year ago, a 1-year treasury bond yielded 1.4%. Today it yields 2.7%. But, the interest rates on long term bonds have not risen nearly as much. 1 year ago, a 30-year treasury bond yielded 2.8%, today it is 3.4%. This has led to what is called a “flat yield curve”. Shorter term bonds have very similar yields to longer term bonds. This is important because holding a long-term bond is risky in a flat yield curve. If we buy a 30-year treasury bond yielding 3.4%, we are locking ourselves in at accepting a 3.4% return every year for the next 30 years. If inflation were to rise, our bond would very likely have negative returns after accounting for inflation. Today, we can get a very similar return by holding a much shorter-term bond, such as a 1- or 5-year bond and not have nearly the same risk. It is very easy to envision long term bonds declining another 15 or 20% over the next couple of years if interest rates continue to rise. If the 10-Year treasury bond reaches a 5% yield, widely considered “normal” just a decade ago, investors in long-term bonds today should expect to see a 20%+ decline in the value of their bonds. For retirees and those looking to preserve and protect their capital, this seems an unacceptable risk to take, so we will continue to take the tradeoff of slightly lower yields on short term bonds in order to avoid the risk of a 20%+ decline in your “safe” assets. With the prospect of lower returns going forward, what should we do? Younger investors have it easy, because declines in the stock market have the potential to benefit you greatly over the long-term. To help show why, consider an investor who saved $1,000 per year in the S&P 500 beginning in 1970. Every year they saved $1,000 regardless of whether the stock market went up or down. If you did that, you would have about $1.5 million today – Despite all the turmoil over the last 48 years, you received a very decent return! But, what if during years where the stock market declined you saved $1,000 extra. If the stock market finished the year negative, you invested not $1,000, but $2,000 at the start of the next year. 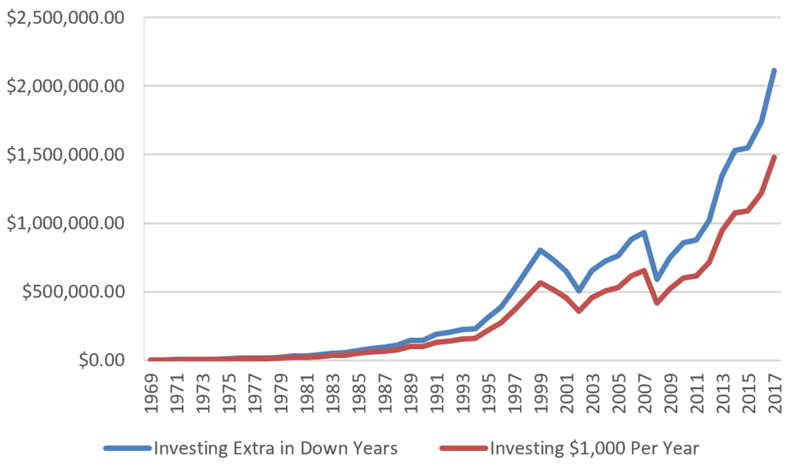 In total you would have invested an extra $11,000 (there have been 11 negative stock market years since 1970). But that extra $11,000 investment would have resulted in your total investment value today to be $2.1 million. It sounds simple, but that is the exact opposite of what a majority of investors do. Instead they sell at times like we are seeing today, and buy several years later after the stock market has again risen. And we are seeing that right now. Just last week alone, investors pulled $12 billion dollars from the largest S&P 500 index fund. For the year so far, investors have pulled $25 billion from the fund. If a couple hundred years of history is any guide, we should be doing the opposite now. For other investors whose savings days are behind them, diversification will be our best friend. On the bond side of our portfolios, as interest rates rise we stand to endure much less pain than many other bond investors since we are allocated to shorter term bonds. But, rising interest rates will benefit you by guaranteeing higher future returns on your bond investments. Over the last 15 years, a portfolio made up of 60% stocks and 40% bonds has averaged a +8.3% return each year. Most of that 8.3% return over the last 15 years has come from stocks. But as interest rates rise, we can count on a larger future return from our bond assets. This means that we can experience a smaller return on our stock investments, but still (hopefully) achieve a decent return. In the end, rising rates for those in or approaching retirement is a good thing in the long run, it just means a year or two of subpar returns now. On the stock side of your portfolio, we will continue to be slightly conservative in our allocation and widely diversified. We have an excess to tools available to us to help weather this storm. We have allocated your investments in stocks, real estate, commodity companies, preferred shares, technology companies, international companies, and more. Whatever asset category weathers this storm the best, you will be there. However, the most important tool we have is patience. Getting excited or emotional has rarely been beneficial for an investor. Companies are seeing higher earnings growth than they have in years, and rewarding shareholders with larger share buybacks and rising dividends. The prospects for continued long term growth in the economy are still there. Whether that gets reflected in how stocks move next month or next quarter is largely inconsequential for a long term investor. Lastly, I think that it is important to reiterate that I “eat my own cooking” here at Hylland Capital. Today, less than half of mutual fund managers invest a single dollar into the portfolios they manage. While they may be telling clients to invest or behave a certain way, they are obviously behaving differently behind the scenes. As a potential investor, that doesn’t exactly inspire confidence. While Hylland Capital is not a mutual fund, I still see our goal as the same – Invest your savings in the attempt to achieve your desired returns. At Hylland Capital, nearly all of my personal savings, and a significant portion of my family’s, is allocated in the exact same funds and portfolios that you are invested in. Not only that, but the income of Hylland Capital is solely dependent on the value of your accounts (that is by design). We believe very strongly that exposing ourselves to the potential of short-term pain, like we are seeing today, is the best course of action for the long-term, for all of us. That doesn’t mean we are guaranteed a certain outcome, only that we share the same fate. And sadly, very few in the industry today can offer even that guarantee. Once again, your trust in us never goes unappreciated for a single day. Thank you!